The dilutions were studied under high-resolution transmission electronic microscope (HRTEM) and energy dispersive spectrometer (EDS). “We are in a position to conclusively prove the presence of nanoparticles in all the high dilutions of homeopathic drugs,” Dr Rajendran said at a press conference here on Monday.A similar study by Dr Jayesh Bellare of IIT-B had also demonstrated the presence of nanoparticles in homeopathic medicines. Dr Jayesh is expected to present the report of the study at the two-day World Homeopathy Summit to be held in Mumbai from April 11, 2015. Drugs like Lycopodium and Psorinum were also studied under Field Emission Scanning Electron Microscope (FESEM) and EDS in a lab at IIS, Bangalore, with similar results. Medicines prepared from plant sources and organic substances are currently being studied in the lab. “The study will, hopefully, settle for ever the controversies over the nature of the materials present in homeopathic drugs. 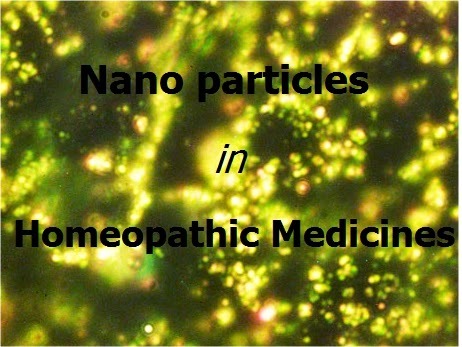 With the finding that homeopathic dilutions are filled with nanoparticles, homeopathy may well be considered a nanomedicine,” Dr Rajendran said. Apart from nanotechnology, the Summit to be held in Mumbai, which is being organised by the Global Homeopathy Foundation (GHF), will discuss the various aspects of homeopathy research, with about 25 scientists and doctors presenting their papers. “At the summit, Mumbai-based homeopath Dr Rajesh Shah, who has developed a new medicine for the treatment of AIDS after sourcing it from the human immunodeficiency virus (HIV) itself, will present his pioneering study,” said Global Homeopathy Foundation managing trustee Dr Sreevals Menon. “The drug has been tested on humans for safety and efficacy, and the results are encouraging,” he said.